We continue the month of traits and mechanics with a mechanic that doesn’t see a lot of play, but features a lot of very powerful effects: Valour. This mode is for the real dare-devils among us who laugh at a Doomed 5 treachery and bring heroes with a starting threat of 35 or higher. The Valour deck isn’t that popular, though some cards do get a considerable boost. Valour is the polar opposite of the Secrecy mechanic and is a bit more recent than it. Rather than trying to keep your threat below 20, the Valour deck tries to get its threat above 40 (or 80 during Dire quests) in order to enter the Valour range (40-50 or 80-99). While in this range, the cards in a valour deck get a secondary action that expand on the normal mechanic of the card. For example, the Hold Your Ground! event usually just readies one Sentinel character. But if your threat is more than 40, you have the option to use the second effect where you ready all Sentinel characters on the board. This can easily make the event 5 times as strong as the vanilla effect, making it really worthwhile to be in the Valour range. The Valour mechanic was introduced during the Angmar Awakened cycle and has since seen several additions over time. There are no real “Valour packs” but if you own several of these packs, you can include all the cards to make a deck that gets stronger when your threat passes the 40. Unlike Secrecy, which is grounded in 3 spheres, Valour only needs 2 spheres: Leadership and Tactics. This is a very useful combo, as you can not only get to a high threat from the start of the game with heroes like Beorn, Aragorn, and Quickbeam, but you are also capable to deal with a lot of enemies that will be engaging you. With a high threat, most engagement checks will see you engaging a lot of enemies so you will need a way to properly defend and kill them. This is where these two spheres excel in, so you should be covered on that part if the encounter deck doesn’t throw out a bunch of enemies at once. There are a couple of things that every Valour deck should be thinking off when going into a game. First off, how do you get to the Valour range? This is done mostly through the starting threat of your heroes, so feel free to experiment with some big lineups. With Gandalf alone, you will already be a third of the way there, and there are several 13 threat heroes that you can run alongside him in order to start at 40 threat. However, it will probably be wise to start a little lower in order to get your board state set up. That way, you can enter Valour mode with some Valour cards in play during round 3-4 and really get rolling. Another great tool for this is Tactics Boromir, who will be able to raise your threat by readying him once per phase. This can lead you to pinpoint more exactly when you enter Valour. There are other ways to get to 40 threat more easily, besides running big heroes (though that is one of the best things about the archetype). You can for instance run Doomed cards to boost yourself to 40 threat rapidly while also getting other benefits. 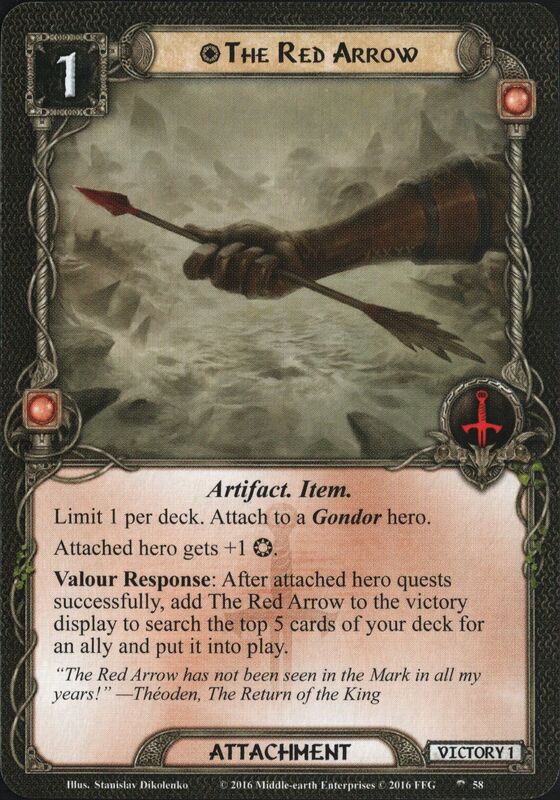 Think of more cards with Deep Knowledge, more resources with Legacy of Numenor, more allies with Herald of Anorien, or to convert damage into threat with Close Call. This does have a drawback though, as all players in the game will have to take the threat alongside you. And while you may be fitted to handle the threat, others might depend on keeping their threat low. That is why this strategy will require some communication with your teammates, or you need to go at it solo. The final way to bump your threat up is through encounter cards. This is pretty dependant on the scenario you are playing, but scenarios like Watcher in the Water, Return to Mirkwood, Into the Pit, and The Nin-in-Eilph will raise your threat rapidly. That way you can start near the 30 threat and be in Valour within a few turns. Once you are in Valour, there is something else you need to worry about, the 50 threat cap at which you are eliminated from the game. You will have to make sure that your threat hovers between the 40 and the 50, but you should be prepared to lower your threat before you reach 50. 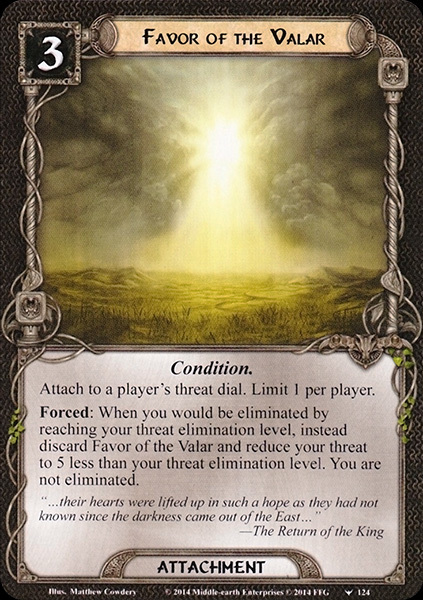 The main card you will want to play is Favor of the Valar, which will serve as your emergency button should you ever pass the 50 threat due to an unfortunate encounter card. Get this card down and you will be able to go back down to 3 lower than your elimination level. While the card is expensive, it will come to bite you in the behind if you don’t have it attached to your threat dial and are suddenly eliminated. You will also need other ways to balance your threat so you can run things like Secret Vigil and Core Set Gandalf to lower your threat every once in a while. Remember that a Valour deck lives on the edge, and you should be careful with raising your threat above 45. Another thing to note with Valour cards is that the Valour action or response is unlocked at 40 threat, but does not replace the original effect. If you don’t want to do the Valour action from Open the Armoury since you know the sixth card in your deck is the piece of armour you need, you can simply select the regular action. The Valour actions are more powerful though so this will be a rare case. As the mechanic isn’t viable on its own at the moment, I feel like players should integrate these cards with other traits and archetypes they like. One of the best combinations in the sphere would be with the Dunedain, who benefit from having so many enemies engaged with them. 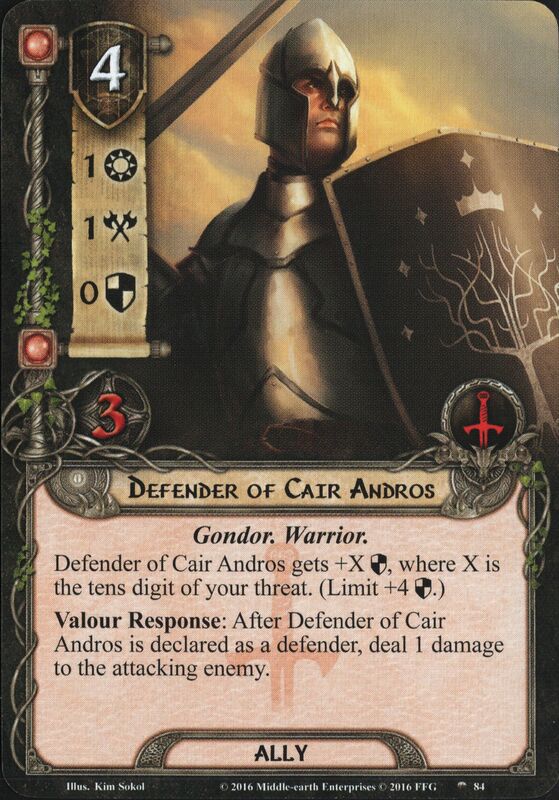 Horn’s Cry will be amazing with Dunedain cards, so that is certainly a combo worth checking out. The other trait that could work well with this mechanic is Gondor. They also have solid defenders and will benefit from cards like The Red Arrow and Rallying Cry in case their allies get defeated. This combo might require some Ranged attack from other players to kill the enemies, but it will also be viable in solo. 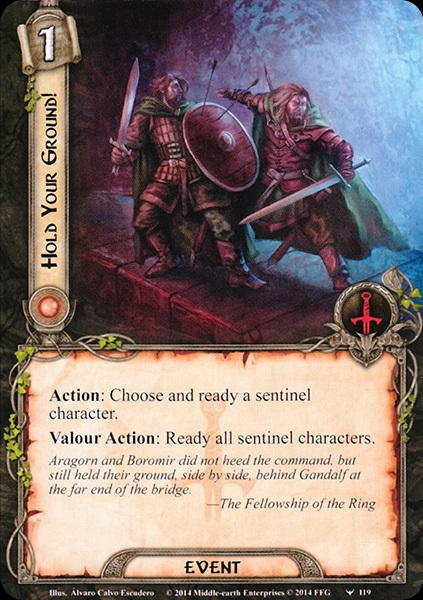 The Valour cards are not used very often in regular decks, but some of them will still appear frequently outside Valour decks. These cards give bonuses in the late game or will never get to trigger their secondary effect at all, but their first ability is strong enough to justify their spot in a deck. One of these staples is one of the most popular ways to cancel damage in any deck, the Honour Guard. It was one of the earliest Valour cards but is still used in decks today for his relatively low cost and a big pool of hitpoints. On top of this, the Honour Guard can be exhausted to cancel 1 point of damage before it gets dealt to a character, resulting in it saving a lot of characters from direct damage or Archery over the years. He is also one of the few characters capable of cancelling damage on Beorn, making him a regular inclusion in a Beorn deck. His Valour ability can be used to save heroes from the nasty Hummerhorns or from an undefended attack. This is not used too often but is always a final resort for those looking to keep their heroes alive. A more recent staple is the Red Arrow. 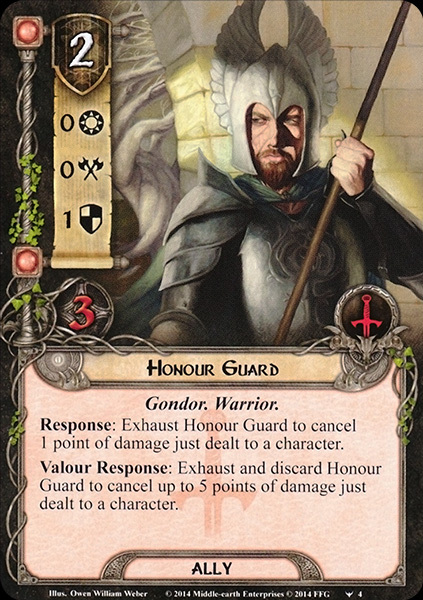 This card gets included in any deck that runs Hirgon, but can also be used on other Gondor heroes to make them quest harder. A 1 cost card that grants 1 willpower is already reason enough to add this in many decks, but it gets better once players enter the Valour range. At that point, the Red Arrow can be added to the Victory Display in order to drag out any ally from the top 5 cards of your deck. This can allow you to get an emergency chump blocker or a useful ally to attack back. The ally will be free and will remain in play, so that makes this card even better. It is only 1 per deck and it is unique, so you are likely only triggering this effect once unless fellow players play their copy after you discarded it. With Valour not really being a very popular archetype (yet), there are a host of cards that sit in the binder for a long time. And if you’d ever want to make a deck with them, you will likely cut them from the eventual deck in favour of other cards. They can’t all be perfect, but here are some cards that I personally have never used nor seen used in other decks. 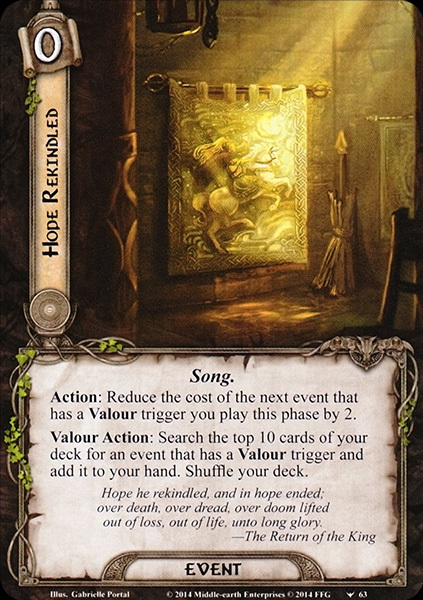 Hope Rekindled is the glue card of the archetype and will lower the cost for the next event with a Valour trigger by 2. Honestly, I have forgotten all about this card as I never see it in use. I’m sure it has some uses, and the -2 cost on events like Hour of Wrath and Fierce Defence make those cards more playable. But it is another cog in the machine and another card you have to have in your hand in order to pull off the combo. I would much rather dedicate the deck space to resource acceleration to overcome the high cost on some of these events. The Valour trigger on this event will fetch you another Valour event and adds it to your hand. However, you just used up your cost reduction card for that event, so you are bound to pay full price for the event you just drew unless you have another copy of Hope Rekindled in your hand. 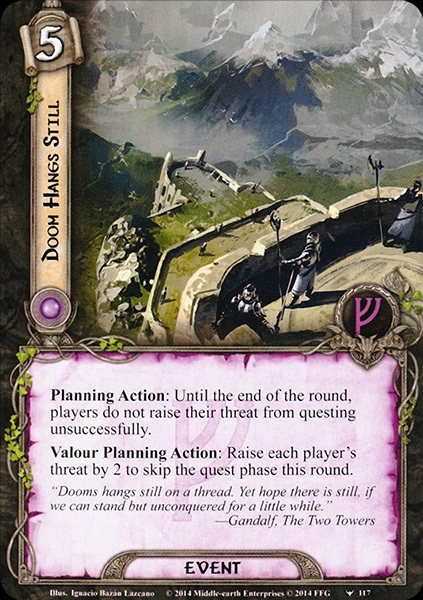 Doom Hangs Still has a great ability, but I think that the initial cost of 5 resources scares a lot of people from including this in their decks. However, if this card is played during the planning phase without the Valour trigger, no player will have to raise their threat from questing unsuccessfully. This leaves all characters ready to deal with combat but will still add one card per player to the staging area. This card invites players to stretch out their game by not making progress for a turn. However, it is an improvement over Ever Onward, which only picked one player to not raise their threat. Playing this card is basically admitting defeat for that round at a steep price of 5 resources, but I could see it used in some cases where you need characters ready for combat. However, this leaves the dedicated questers sitting idly by, doing nothing. The Valour trigger adds a Doomed 2 to the cost of the card in order to skip the entire quest phase for that round. While this again makes you incapable of making progress that round, it at least doesn’t reveal more cards to the staging area. But this comes at a very steep cost and is only reserved for very cornercase scenarios. This leaves Doom Hangs Still in most binders, and if you do decide to use it, you better have it in hand and the resources to pay for it. While there are not enough cards yet for a full Valour deck, these decks like to live at the edge of their threat meter and run some Valour cards. If you ever feel like running a powerful deck, give these a shot. Hope those decks will entertain you for a while. Next time we will likely cover both the Esgaroth and the Dale trait, as the cycle is coming to an end and most of their cards are now known to us. I will wait a little with the remastered versions of some of the older articles, as more cards just got spoiled. If I were to redo the Eagle article now, I’d have to wait until Fate of Wilderland to do it again with the new Eagle and Istari cards. So I will do my best to cover the rest of the traits and will redo the old ones once we have a full cycle of spoiled cards.